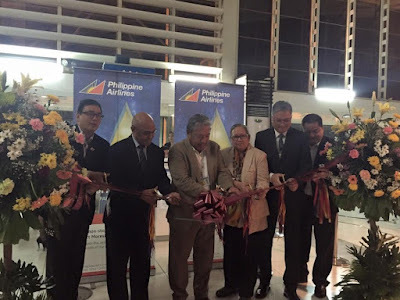 Aviation Updates Philippines - National flag carrier, Philippine Airlines sent off its inaugural flight to Port Moresby, Papua New Guinea (PNG) on Friday, December 18, 2015. MAIDEN FLIGHT. Jaime Bautista welcomes guests and passengers during the launch at the Ninoy Aquino International Airport. Photo by Philippine Airlines. 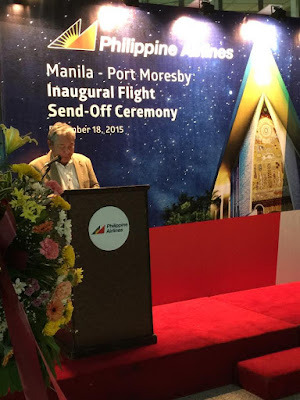 During the launch, Philippine Airlines President and Chief Operating Officer Jaime Bautista welcomed the guests and passengers for our Manila - Port Moresby, Papua New Guinea inaugural flight. Ribbon Cutting ceremonies led by PAL President and COO, Jaime J. Bautista and Ambassador of Papua New Guinea to the Philippines Christian Vihruri. ROAD TO PNG. Philippine Airlines officials cut the ribbon signaling the start of the new PNG service. Photo by Philippine Airlines. According to Philippine Airlines, the airline will fly to Port Moresby thrice weekly using its Airbus A320-200 aircraft. The new service will serve 30,000 Filipinos living in Papua New Guinena and also people living in PNG. Philippine Airlines Flight 215 departs Manila at 2:10 AM and arrives Port Moresby at 9:20 AM. The return flight, Philippine Airlines Flight PR 216 departs Port Moresby at 10:10 AM and arrives back in Manila at 1:20 PM. Philippine Airlines recently launched its flights from Manila to Auckland via Cairns earlier this month. According to Bautista, the new service to the Middle Earth will surely provide seamless travel for Filipinos and Kiwis wanting to visit the Philippines.